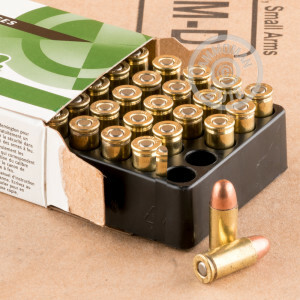 Practice makes perfect, so grab this 500 round case of inexpensive Remington UMC range cartridges in .32 ACP for your carry pistols. 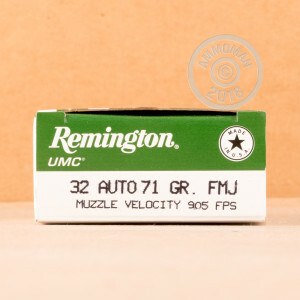 Each round fires a 71 grain full metal jacket ("metal case" in UMC jargon) bullet at a muzzle velocity of 905 feet per second. 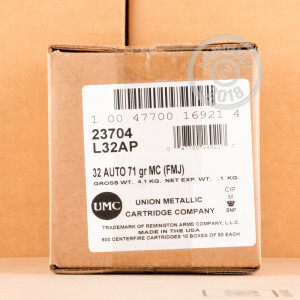 Remington ammunition is loaded in Lonoke, Arkansas using non-corrosive Boxer primers and brass case. Buy this case or any other items totaling over $99 to get free shipping from AmmoMan.com!